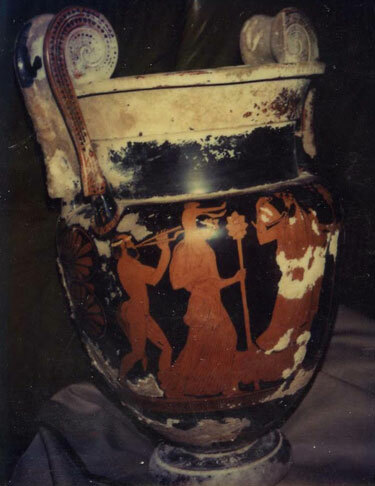 Left: A Polaroid from the files of convicted antiquities trafficker Giacomo Medici of dirt-encrusted Athenian Red-figure volute krater, attributed to the Methyse Painter, 460-450 B.C. As CultureGrrl readers may remember, Kaywin Feldman, director of the Minneapolis Institute of Arts and president of the Association of Art Museum Directors, recently shot off a letter to the editor of the NY Times, taking exception to the paper’s Repatriating Tut editorial that criticized museums’ reluctance to repatriate cultural property. information about specific works may come to light. responsible fashion.” (The full statement was reproduced here; the museum has confirmed to me today that it is accurate.) Feldman succeeded Griswold (now director of the Morgan Library and Museum) on Jan. 1, 2008.
artifacts found by Investigators during a 1995 raid on a warehouse owned by subsequently convicted antiquities trafficker Giacomo Medici, through whose hands a number of illegally excavated antiquities had passed before being acquired by (and subsequently repatriated by) several U.S. museums. 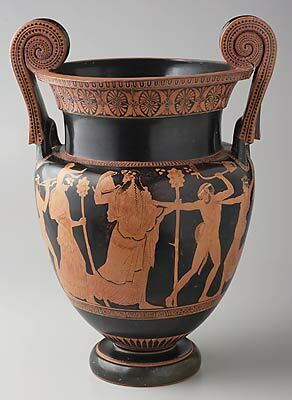 Looting Matters blogger and archaeology lecturer David Gill recently highlighted the discrepancies between Feldman’s NY Times letter and her institution’s actions (or inaction) regarding its own krater. I decided to contact Anne-Marie Wagener, the museum’s director of press and public relations, for an update on that situation. In my first e-mail to her, I linked to two of Gill’s blog posts, in which he connected Minneapolis’ krater to the Medici Dossier and reported that it had arrived at the museum in the 1980s via dealer Robin Symes. How, I asked, did Feldman respond to Gill’s call for her to investigate the piece and to “contact the Italian authorities”? taken steps to address them. Thanks for your inquiry. Fair enough (although five years seems like a long enough time in which to have concluded the provenance research). Since Looting Matters allegedly never asked questions or tried to “confirm any facts,” CultureGrrl would pick up the ball. What I quickly discovered, though, was that the museum wasn’t nearly as keen to entertain questions as it purported to be. the krater (as you say you have done)? Medici polaroid that Gill reproduces at the second-linked post? museums to return ex-Medici objects? seemingly dicey history of this krater? that’s in the registrar’s records. I just wanted to let you know that MIA is taking steps to research the krater and for now that’s all we can say about it. What I finally did manage to find on the museum’s website about the krater (by clicking a link on one of Gill’s posts) is that it was purchased by the museum in 1983 with funds from Mr. and Mrs. Donald C. Dayton. And while we’re on the subject of Greek antiquities, has no one yet noticed AAMD’s new get-tough stance towards Greece’s recent request for U.S. import restrictions on antiquities from Greece? Take it away, David Gill!